Wed July 28th, @ 8:00pm, Lisa was interviewed on "In the Know," an audio blog about today's best and brightest professionals. "Lisa Alexander is the Founder and CEO of Green Life, Inc., A company committed to educating the public on how to live healthier, more sustainable, and practical “Green” lives. 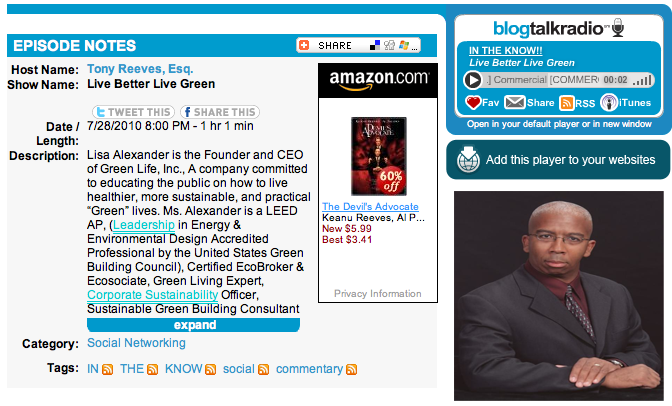 Ms. Alexander is a LEED AP, (Leadership in Energy & Environmental Design Accredited Professional by the United States Green Building Council), Certified EcoBroker & Ecosociate, Green Living Expert, Corporate Sustainability Officer, Sustainable Green Building Consultant and her company is a memeber of the United States Green Building Council. Dubbed by some of her contemporaries and journalists as “The Queen of Green”, Ms. Alexander can best be described as a female Bob Villa and a Green Martha Stewart rolled into one." Lisa is featured on Blogtalkradio.com as part of April's Women in Green Technology month.